A superb reissue with bags of class. Beautiful repro with sensible upgrades and TV Jones's best-selling Filter'Tron recreation. Not for the meek; it's also a big and quite heavy ol' bird. One of the showiest electric guitars ever conceived, even today, the White Falcon - although the nitro finish is slightly nicotine-stained - is not for the shy, retiring player. With its slightly larger body (430mm wide as opposed to the 400mm of our other three models), it also has a longer scale length and uses the quite robust Trestle-style bracing, no doubt contributing to its heavier- than-the-6120 weight. Numerous new features were introduced by Gretsch in 1958, not least the Filter'Tron humbuckers, here replicated with TV Jones's Classics. We also get the Neo-Classic fingerboard (ebony, not rosewood) and those ultra-classy Neo-Classic half moon (aka 'thumbnail') inlays. Again, the binding is remarkably clean, and made from a gold metal-flake plastic, like the bigger logo on the elongated and huge headstock. Gold-plating is everywhere on this model, and we have the Space Control bridge with knurled wheel saddles and V cut-out 'Cadillac' Bigsby. The electronics differ, too, with the 'Tone Switch' circuit that replaces the master tone control - with a three-way- toggle master tone switch placed below the pickup selector on the upper shoulder, plus two individual volume controls by the Bigsby and the single master volume on the rounded horn. Control knobs are the later 'arrow-through-G' types, with added mother-of-pearl centre-dot and red-crystal position markers. The epitome of bling. 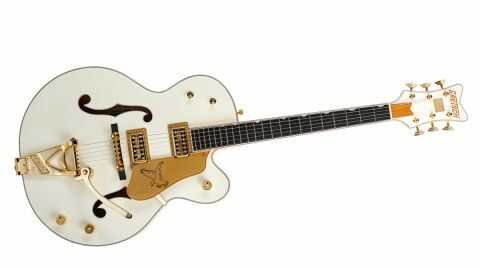 At £3.2k, the White Falcon is a serious investment, although its sturdy build and long scale (not to mention those Filter'Trons) give it perhaps the most versatile sonic palette from the latest batch of guitars from Gretsch.